Portraying traditional cinematic narratives in virtual reality (VR) is an emerging practice where often the methods normally associated with cinematic storytelling need to be adapted to the \(360^\circ \) format. 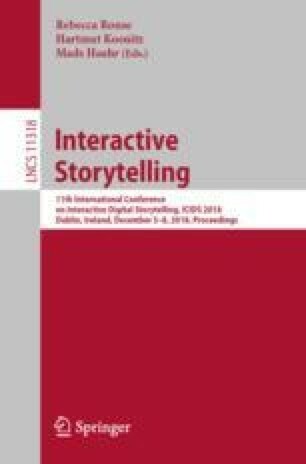 In this paper we investigate some proposed cinematic practices for narrative storytelling in a cinematic VR film set in late 9th century Ireland that follows the perilous journey young Celt as he evades being captured by Viking raiders. From this we will analyze the fidelity of those practices with results collected from YouTube Analytics. This publication has emanated from research supported in part by a research grant from Science Foundation Ireland (SFI) under the Grant Number 15/RP/2776.